The one thing that every home buyer has in their sitting area are sofas. Depending on personal preference and liking, people either spend on couches, sofas, or bean bags. With ever-soaring rents, people are left with limited, lounge-furnishing options. A slight deviation from the traditional sofa set is sectional sofa sets. What are Sectional Sofa Sets? Sectional sofa sets are simply sofa sets that can easily be taken apart and moved around. Consisting of two or more pieces, you can move the sofa around to suit your space and seating needs. If you are looking for a bit more, have a look at our article about cheap living room sets! Suited for smaller spaces, the sofa itself is a three-seater sofa with a movable chaise. Available in a number of colors, this sofa set comes with two decorative pillows. With dimensions of 76” Width x 50” Depth x 28” Height, the sofa set is not only affordable but also very well suited to limited lounge space. The fabric: The fabric used for the exterior of the sofa is lush, soft linen. Comfortable and durable, the look that the cloth interior gives to the sofa is incredibly posh and chic. The base: The base is a sturdy hardwood, that is not only easy to clean but also durable. Moreover, it provides the much-needed stability to the structure of the sectional sofa. Reversible chaise: The reversible chase is not only multi-purpose but can also be moved around for a number is uses. Doubled as a foot rest, the chaise can also be used as an extra seat when in need of additional seating space. The price: Extremely affordable, this is a 4 seater sectional sofa set that is available for a fraction of the price. The height: Though the base is sturdy, the height of the legs of the sofa is not adequate. It only makes for a low seating sofa set and also makes the sofa appear smaller. Lack of adequate armrest cushioning: The sofa feels a bit hard due to lack of cushioning. The armrest feels a bit hard because of the lack of foaming and makes resting a bit uncomfortable. Narrow seats: The sofa itself is rather small – though perfect for small apartments, the seat are slightly narrow and more appropriate for younger children. This sofa set can accommodate approximately 5 people and comes with a set of five pillows. Sectional, with an easy-to-move armchair and ottoman, the sofa set has two movable parts. Two movable parts: The sectional elements of the sofa set are the ottoman and armchair. Extremely useful for small spaces and easy moving, the two movable parts can be rearranged and used for a number of things. The sofa essentially can be easily separated into an armchair, an ottoman, and a 3 seater sofa. The exterior: The exterior of the sofa is a microfiber cloth that is extremely easy to clean and maintain Moreover, the elegant classic color combined with good quality fabric adds $$$ worth of look to the sofa. The base of the sofa is a high-quality, hard plastic. Now though this makes the sofa set lightweight, it also takes away in terms of durability. Hard wood bases are better than plastic bases; moreover, however low the price may be, the plastic base has a shorter life than the much long-lasting wood. Some buyers find that the seats are a bit too narrow for comfortable use when there are more people. Moreover, the sofa is smaller than what it appears to be. 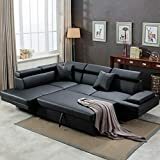 With dimensions perfect for around 3 adults, this sectional sofa set has a reversible chase that can be moved to either side of the sofa for comfort. The exterior is stylish black leather that makes the sofa look chic and modern. Adjustable section: The movable section can easily be moved to either side of the sofa. Moreover, the backrest design enables the chaise section to be used as an individual piece in either of the rooms. Easy to dust leather: Better than fabric exteriors, leather interiors are easier to clean and wipe. The dust can be wiped off easily and in the case of spillage, leather sofas are easier to clean than fabric covered ones. Comfortable: Extremely comfortable, the sofa has adequate cushioning for comfortable and peaceful naps. Price: Perhaps one of the best things about this sofa set is the low price. Extremely affordable, the price is a bargain deal for the quality and looks. Small: Can only fit 2-3 adults comfortably. This makes it only suitable for small families. Futon style, the sofa comes in either classic beige or a cool, sky blue. The design of the sofa is a more mid-century and gives a classic look due to the foot design of the base. L-shape: The shape of the sofa adds a modern look to one’s lounge. Moreover, L shaped sofas are better for napping and foot rest. Reclining back rest: One of the best features of this sofa set is the reclining back rest. Each of the three seats can be easily and individually reclined using the reclining option. This not only provides additional back support but also make it suitable for causal lounging. Reversible chaise: the chaise is reversible and can be moved around with ease. It either be put on either side or in front of the sofa set as a foot rest. The fact that it is reversible also makes it multi-purpose. Price: For a sofa with such features, they have priced their product extremely well. Reasonable and light on the pocket, this sofa has high value for money. High-density foam: The foam used in the sofa set is high-density foam. This adds adequate cushioning for comfortable sitting. Low height: The height of the sofa might be an issue for some people. The legs on the base are short, making the sofa a low-height furnishing option. Only two cushions: Albeit being a three seater with chaise, the sofa set only comes with two small cushions. The buyer will have to invest an additional amount to buy cushions and pillows for the sofa. Suitable for families of 3 to 4 people, this sectional sofa set is more suited to slightly bigger lounge areas. The extra wide chaise provides additional comfort and space. The dimensions of the sofa are 96″ Width and 27″ Height. The price of the sofa set is inclusive of seven foam-filled cushions. Extra wide chaise: The movable chaise is extremely wide and perfect for lying down and relaxing. Both the width and the length of the chaise is more than that of a small sectional sofa set. Additionally, the chaise is movable; moreover, the presence of a side handle enables it to stand as a separate sofa on its own. Fabric: The fabric is very soft and cozy. The durable, linen exterior is not only durable but also adds additional comfort to the user. Plush Pillows: The sectional sofa set comes with seven plush, foam-filled pillows. The material of the pillows is the same, durable linen as the fabric used on the exterior of the sofa set. Easy to clean and soft, the pillows add the perfect amount of back support to the user. Comfortable Sitting seats: The seats are filled with foam. The foam used is not only durable but also soft and user-friendly. Non-reversible chaise: The movable section of the sofa is a non-reversible chaise; it cannot be moved to either side. It has to stay on the left due to the design of the sofa set. This is an issue for people who buy sectionals sofas so they can move them around for additional foot support etc. A bit firm for prolonged use: We felt that though the foaming on the seats was comfortable, it wasn’t for prolonged use. The padding is not suited for prolonged use or long naps due to it being a bit hard.